We are by no means cryptocurrency experts. In fact, we even joked last year that we would never write a note on blockchain. However, we are known to be market structure critics and what we see currently happening in the cryptocurrency world worries us. Why the change of heart from the CME? Apparently, the CME is getting “a huge amount of demand” from their clients to trade bitcoin futures, according to their CEO Terry Duffy. And since the Cboe has already said they intend to list bitcoin futures and the smaller LedgerX is already trading bitcoin swaps and options, the CME appears to have caved in to the pressure. Ok, so why does Themis Trading care about bitcoin futures? Because we see the same problem forming here that has been going on in the equities market for years. Large, high frequency clients demand a product from the exchanges and the exchanges (who are for-profit, public companies) comply even if they have their own reservations because they don’t want to miss a profit opportunity. 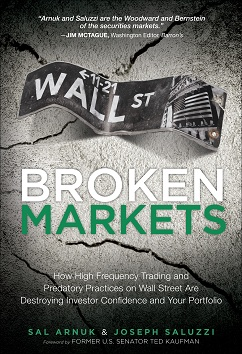 In the equity market, we saw major exchanges like the NYSE and BATS get fined millions of dollars because they caved in to the pressure of these clients by doing things like improperly sending market data to proprietary customers first and not disclosing special order types. We think that the CME knows that the underlying market for bitcoin is very suspect. We think they know that the bitcoin exchanges have been subject to numerous cases of fraud and theft over the past few years. We think they know there is no government regulatory body overseeing the bitcoin exchanges. We think they know that spoofing and layering could be running rampant on these exchanges. So, how does the CME rationalize creating a futures product based on an underlying market of bucket-shop exchanges? They created a reference price known as the CME CF Bitcoin Reference Rate (BRR). This reference price is a volume-weighted average of select five minute time intervals that are provided from only a select number of bitcoin exchanges. The CME noted that weighted-averages were necessary because “bitcoin spot prices have historically varied considerably across trading venues, in particular in times of high volatility.” But just like that, the creation of an index has apparently legitimized bitcoin trading. One commenter on the Winkleoss ETF noted that “it would be surprising if illegal and manipulative practices did not occur, since they would be easy to implement, impossible to detect, perfectly legal, and extremely lucrative”. Unless the SEC’s concerns about the lack of regulation of the underlying exchanges is dealt with, we think it would be irresponsible and dangerous for the CFTC to approve the bitcoin futures proposals. These products remind us of the collateralized debt obligations (CDO’s) which were peddled during the financial crisis. Those were instruments that essentially placed a seal of approval around very risky mortgages. A bitcoin future would be placing a seal of approval around a very risky, unregulated instrument that has a history of fraud and manipulation. Our bigger fear is that if the CFTC approves bitcoin futures, then the SEC might be swayed to approve bitcoin ETF’s. Once this happens, it will be too late to go back. These ETF’s would likely be buried in numerous portfolios that do not have a risk tolerance for trading an asset that is unregulated. We are not ant-bitcoin. We are not anti-futures. We are not anti-ETF. But we are anti-manipulation and anti-fraud. As the CME president noted, the bitcoin exchanges are very nascent right now. Until they clean up their act and address their surveillance issues, we don’t believe that any derivative cryptocurrency products should be approved. ← MiFID II? Unbundling? Best Ex?